Aditya Birla Finance Limited (ABFL) is a non-banking financial company (NBFC) which customizes private financing solutions to help businesses achieve success. Incorporated in 1991, the company offers customized solutions for Capital Market, Corporate Finance, Commercial Real Estate & Mortgages and Infrastructure Project & Structured Finance. When ABFL approached Techmagnate for its PPC services, they had a very clear and precise goal - generate thousands of leads from SMEs, Entrepreneurs, Self-employed people looking to avail Business Loans. The target market, comprising of small business owners, entrepreneurs and self-employed professionals, was a small one. The search inventory on Google network for the target audience was very limited. There were already several established lenders operating in this small, but hyper competitive market. To deliver thousands of leads from such a small target market at a predefined Cost Per Lead (CPL) was always going to be a tough challenge. It was going to require all our experience and expertise to deliver a perfectly targeted PPC campaign and meet the numbers! This PPC campaign was launched in the start of the year 2017. This ABFL campaign was launched in January 2017 for 3 months until March 2017. Audience: Our first task was identifying the target cities where the relevant business audience would be available. First point reference was the client data of top 20 Indian cities with high concentration of registered businesses. Second point reference was client’s Google Analytics data of top Indian cities sending most traffic over the past 1 year. Third point reference was search volume extracted from AdWords. All three data sets were mapped to arrive at a final list of 13 cities for targeting. Execution: We started the lead generation campaign with Google Search using relevant keywords to attract users looking for business loans. We realized very quickly that Search traffic was limited, and we wouldn’t be able to hit lead targets based on the search campaign. To increase the volume of leads, we planned a strategy especially focusing on for Google Display. Contextual and Topic based targeting - we identified placement categories based on business loans, MSME loans, working capital etc. These were layered with demographic targeting. The top performing placements were clubbed into a Managed Placements campaign layered them with demographic targeting. Gmail Sponsorship Promotion (GSP) Ads - Always keen to test new features, we utilized this technology very effectively. We used contextual targeting, based on keywords and competitor domains, within Gmail to generate leads. Interest + Custom Affinity Audience Targeting – We built a custom affinity audience based on 1)specific keywords and 2) competitor URLs. We layered Interests over this to define a highly relevant audience. In-Market Audience Targeting – Since competitors were already advertising aggressively, we knew we would be able to find In-Market audiences. This technology was used with great results. Smart Display – We used the Smart Display Campaign Optimizer to manage targeting and bidding for Display campaigns automatically. This helped us find conversions at the desired cost per lead. 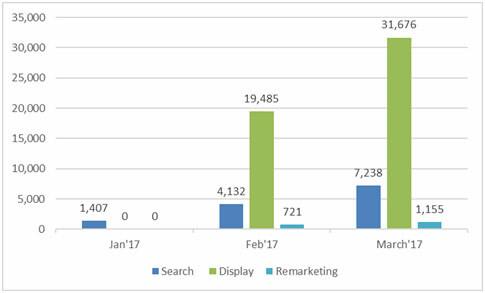 Remarketing - We utilized the search network data to re-market on the display network. While effective in terms of cost per lead, it couldn’t deliver volumes based on search volume limitation. All Campaigns on the display network were optimized on a regular basis by eliminating low performing placements and audiences, optimizing bids at device level and excluding low converting locations. In a result-oriented market nothing speaks better than success and we achieved fantastic results for our client. 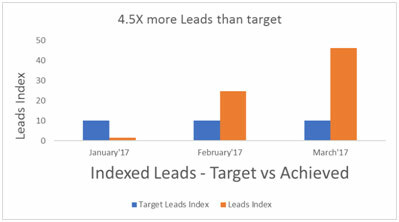 We managed a stupendous growth in leads to 4.5 times the assigned target. And this was achieved without overstepping the CPL. This phenomenal increase in leads resulted from a massivelysuccessful Display campaign, as can be seen in the section below. 93% of the total impression were served by the Display network. NOTE: Display includes Topic, Context, Custom Affinity, In-Market, GSP, Smart Display campaigns. Though part of Display, Remarketing has been shown separately. Where the leads came from? Contextual and Topic based Targeting - contributed close to 40% of Display leads. Gmail Sponsorship Promotion (GSP) Ads - contributed a very significant 20% of Display leads. Remarketing Ads - contributed close to 5% of Display leads. We, as a company, thrive on challenges and we were thrilled to exceed expectations by such a large margin – we managed 4.5 times more leads than the client’s target! As the chart below depicts, our lead numbers dwarfed the targets. NOTE: The absolute numbers have been indexed to facilitate the comparison of growth. When used intelligently Display Advertising can be very effective medium for Performance Marketing.